This is the last week I’m going to devote to books and we have eight more bookcases in our house. It’s not as bad as it sounds though since 2 hold my professional books, 2 are for Jim’s work, and 4 are our kid’s bookcases. In the interest of family harmony, I’m not going to mess with any of these bookcases. I’m conceding them as unavailable for pruning. I did, however, find books in two hidden places and those are this week’s treasures. 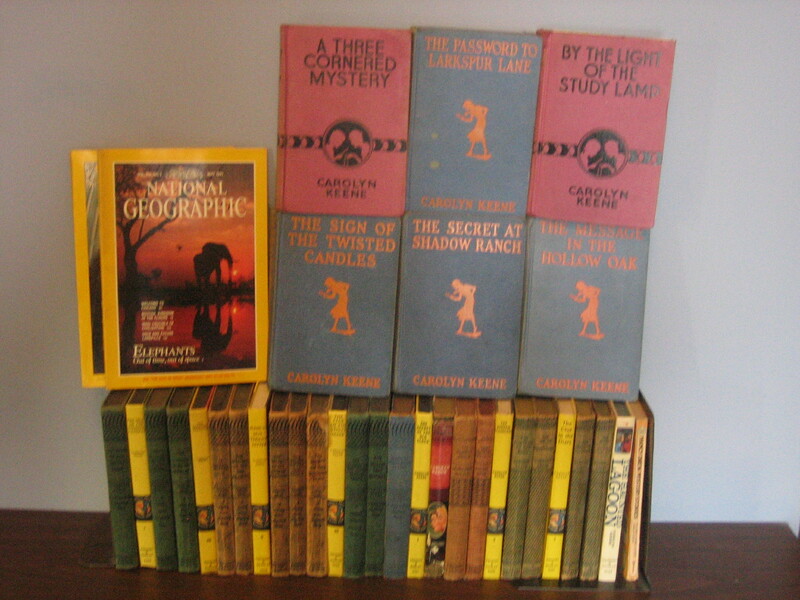 I had forgotten that I had 33 Nancy Drew/Dana Girls books stored away. Some of them were my mother’s and dated back to the 1930’s. I looked them up on E-Bay to see if they had any value. 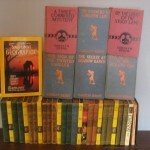 Since mine didn’t have dust jackets most were only worth a few dollars. I decided not to fuss with selling them on E-Bay so I took them to a local store that specializes in vintage books and got $60 for the lot. Not as much as E-Bay but I figured I wouldn’t be able to keep the money anyway since I’m supposed to be giving these things away. I decided to put the money toward a $100 bus ticket for a family we know that needs money to move a few states away. I also found over 300 National Geographics hidden in an alcove. They date from 1973 to 1993. No book store would take them so I’m hoping some local grade school can use them for cutting out pretty pictures. I did a lot of that when I was a child. Apparently National Geographics are only really valuable if they’re from the 1800’s. I hope, however, that school kids, will recognize their value. PS: Oops, I just found another bookcase in the corner of the basement. The books all belong to child #4 so I dare not mess with them. They are more recent novels and text books. I can’t send them to him because he’s in Singapore. Maybe if he needs some cash, he’d let me sell them.